Project Co-Directors: Ken Grossi, Oberlin College Archivist and Maren Milligan (co-director in 2010-11), Visiting Assistant Professor in the Oberlin College Politics Department. Theodore Waddelow '11 served as the research associate for the project. Other library staff members who provided vital assistance include Alan Boyd, Associate Director of Libraries; Anne Salsich, Assistant Archivist; Marsha Bansberg and Sarah Richardson, Digital Projects Interns; Xi Chen, East Asian and Web Development Librarian; and Cecilia Robinson, Electronic and Continuing Resources Assistant; Marwa Badow, Arabic Language Fulbright Fellow; Khalid Madhi, Arabic Materials Associate; Sonia Roubini, French Materials Associate and Research Assistant. The University of Illinois Archives and the Hoover Institution Archives at Stanford University graciously facilitated the inclusion of portions of the Albert H. Lybyer Papers and the Donald M. Brodie Miscellaneous Papers in the collection. 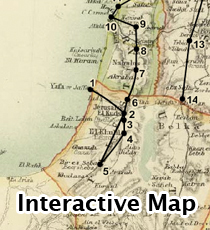 This interactive map depicts the journey of the King-Crane Commission in the Commission, and is also a search tool for navigating the digital collection based on the spatial scope of individual documents and photographs. Group portrait of the King-Crane Commission and other persons unknown, in Damascus, 1919. Identified persons include Sami Haddad (standing, in white suit), Commissioners Charles R. Crane, and Henry Churchill King (seated at table, left to right), Albert Howe Lybyer (seated, to right of King), and George R. Montgomery (seated, far right). 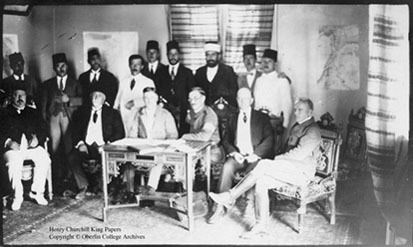 During the summer of 1919, a delegation under the leadership of Oberlin College President Henry Churchill King and Chicago businessman Charles R. Crane travelled to areas of the former Ottoman territories. Their mission was to determine the wishes of the people of the region as their future was being determined by the major powers at the Paris Peace Conference. The King-Crane Commission, as it became known, met delegations and invited written petitions from various religious and political groups. 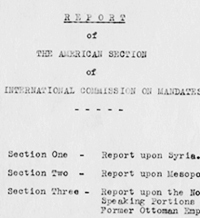 This digital collection unifies the archival records of Commission members for the first time. It also includes resources on conducting research in the collection. To learn more about the collection, please read the full introduction to the King-Crane Commission digital collection.